Policies regarding Military families play an important role in building strong military rear and directly impact on those who worked and are working in the Military as well as the forces in charge of military and defense missions in localities. Thus, it is the responsibility of the whole Party, people, military and political system, particularly party committees, authorities and leaders at all levels to successfully implement those policies. In periods of national liberation and Homeland construction and protection, the Party and the State issued guidelines of deep socio-political significance while raising a sense of responsibility of organizations, sectors and society in their entirety for the implementation of the policies regarding military families. Party committees and commanders at all levels in the Military have strictly implemented those policies in a synchronous, comprehensive and effective way, particularly for the forces assigned to special, new missions as well as revolutionary contributors and military families. It should be noted that policies and entitlements for families of active soldiers, workers and defense employees have been ceaselessly completed and fully implemented in accordance with regulations, thereby contributing to improving the material and mental life of military families and families under preferential treatment policy. Housing policy for military staff has been given regard and gradually bettered. The Ministry of National Defense (MoD) has adopted measures to resolve difficulties in projects for social housing. Offices and units have actively cooperated with localities in their stationed area in providing land and effectively implementing projects for social housing in accordance with the particularities of units and localities and the regulations of the State and the MoD. This policy has been implemented on a procedural, public, transparent basis, thereby creating a sense of unity. The activities of the policies regarding military families and the “Gratitude” Movement have been implemented widely and deeply while responsibility of the whole political system and the tradition of “remembering the source when drinking water” have been promoted, and the policies regarding military families have been gradually “socialized”. The search and collection of martyrs’ remains has been effectively executed. Units and localities have successfully conducted the work of propagation, provision and processing of information on martyrs and graves of martyrs; reviewed and completed profiles and lists of martyrs; decoded the number of units involved in the wars; consolidated the organizational structure of the forces in charge of the search and collection of martyrs’ remains. The Military Policy Branch has proactively carried out surveys, studied, proposed and executed policies and entitlements for those who have fatal diseases, or diseases with long-term treatment, or mental illness; mobilized resources to support the infertility treatment of servicemen. Due attention has been paid to conducting the work of hunger eradication and poverty reduction, supporting military families in difficulty and improving living standards of military staff. Units have successfully conducted the work of providing free-of-charge examination and medicine for the people in remote, isolated areas and those in difficulty under the “Military-civilian medical coordination” Program for the sake of public health. At the same time, they have actively assisted the people in natural disaster prevention and mitigation and the building of new-style rural area, while successfully executing the Project to provide vocational education for active soldiers and employment for those who have fulfiled military service in the 2013-2020 period and beyond as well as the Project to select and include discharged soldiers in the planning of the contingent of commune-level cadres. In addition to the gained results, there remain weaknesses in the implementation of the policies regarding military families in several units and localities. The work of propagating and disseminating the Party and State’s guidelines on those policies has yet to be regular and widespread. The work of caring and assisting revolutionary contributors and military servicemen who are in difficulty or working in isolated, remote, border, sea and island areas has yet to be practical and timely. Several policies and entitlements have been implemented slowly and inactively without creative approaches. Currently, the cause of military building and Homeland defending is facing the increasingly demanding requirements. The Military’s task has witnessed new developments. Many issues on the policies regarding military families get entangled. To better execute the policies regarding military families, it is necessary to focus on the following points. 1. Grasping the Party and State’s guidelines and policies and promoting the national tradition of “remembering the source when drinking water”. Accordingly, it is important to promote the role of press agencies both inside and outside the Military as well as of local organizations and unions to raise awareness and responsibility of sectors, units and localities, particularly party committees and leaders at all levels towards the policies regarding military families. At the same time, it is vital to give instructions on and clarify the policies and entitlements, particularly new ones, for the military staff, people and beneficiaries to fully understand, thereby creating unity within the society and heightening responsibility and involvement of the entire political system in the implementation of the policies regarding military families. 2. Staying close to the task requirements and the situation, the Military Policy Branch should proactively study, amend, supplement and well execute policies and entitlements on military salary, allowance and subsidy. To do so, priority should be given to studying and proposing policies for new forces and special tasks; the forces in strategic, remote, isolated, border, sea and island areas; the forces assigned to international missions; the forces in charge of the search and collection of martyrs’ remains; and a contingent of high-caliber human resources in the Military. It is necessary to well implement policies and entitlements regulated by the Law on professional servicemen and national defense workers and officials, the Law on Military Service 2015, and the Ordinance on Vietnam’s Coast Guard. At the same time, due regard should be paid to carrying out surveys, studying and proposing policies for the forces who worked and are working in the areas affected by agent orange/dioxin; to reviewing, amending and supplementing promulgated policies and entitlements in accord with reality and task requirements. 3. Well implementing policies and entitlements regarding military families with priorities given to families of those who work in disadvantaged areas. In this regard, it is necessary to promote the synergy, and mobilize all possible resources to support families of soldiers, defense workers and officials in severe difficulty. At the same time, it is vital to study and propose housing policies for military families; to proactively counsel and effectively implement social housing projects; to prioritize the support for revolutionary contributors, servicemen with special achievements, and low-income ones. 4. Strictly executing policies and entitlements for revolutionary contributors under the Ordinance on preferential treatment policy for revolutionary contributor and the Directive 02/CT-TTg, dated January 25th, 2016, by Prime Minister. The Military Policy Branch should cooperate with functional agencies and localities in reviewing and dealing with post-war issues, opportunely recognizing war invalids, sick veterans, and martyrs for those who was wounded and died when performing military and defense tasks. Moreover, it should enhance inspection and supervision of the implementation of the policies for revolutionary contributors to ensure that these policies are executed closely in accordance with regulations and to avoid shortcomings and negative phenomena. 5. Continuing to grasp and effectively implement the Politburo’s Directive 24-CT/TW and Prime Minister’s Decision 1237. In this regard, it is essential to actively complete the database of martyrs and graves of martyrs and the maps for the search and collection; to promote the synergy and all resources and adopt synchronously measures to step up the search and collection of martyrs’ remains in the areas nationwide. At the same time, it is necessary to expand international cooperation and enhance information exchange and provision related to martyrs and graves of martyrs; to basically complete the search and collection of martyrs’ remains in Laos, Cambodia and other countries. 6. Consolidating the organizational structure of policy offices and staff to meet the task requirements in the new situation. To do so, it is vital to build the Regulations on the military policy work; to manage and strictly maintain the order for this work; to accelerate administration reform and gradually standardize the procedure for this work. Besides, it is necessary to invest in facilities and apply information technology to the policy work; to manage and effectively exploit the Military Policy Branch Web Portal. And it is important to step up the work of theoretical and practical study on military policy; to improve the knowledge, awareness, professional competence, morality, responsibility and working method of the military policy staff. 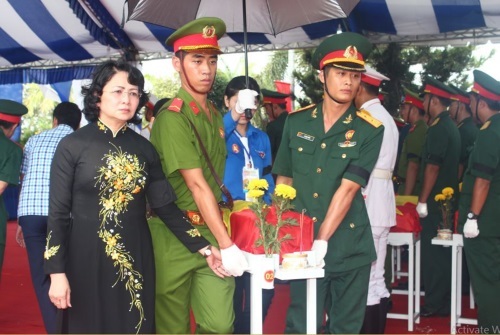 Successful implementation of the policies regarding military families is a task of routine and great significance which reflects Vietnamese nation’s culture and tradition of “remembering the source when drinking water”. And stepping up this work will contribute to building the solid “people’s hearts and minds posture” and the increasingly strong Military.